For now, Noah Wotherspoon is just one more in the massive pack of today's young, hotshot blues guitarists. The baby-faced prodigies, paced by the likes of Jonny Lang, have a huge share in today's blues market - so much so that lumping together all such usually white kids becomes easy and somewhat necessary. Don't make that mistake with Wotherspoon, the 19-year-old bluesman from Dayton, Ohio. His debut release, Buzz Me, will make fans and guitar slingers alike THINK. Wotherspoon may be jumping an already-steady-rolling train, but he may just be the best one yet to ride. To ground any notion that this release is not real blues, APO called on their friend Hubert Sumlin for a few tracks to bring some roots stew to Wotherspoon's incredible guitar technique and more-than-meets-the-eye vocals. And as Jimi Hendrix guru John McDermott noted in the liners for Buzz Me, "A litnay of musical influences is evident throughout the record. Wotherspoon's admiration for Stevie Ray Vaughan is clear, just as a healthy measure of country and western can also be heard." Seven of the eleven tracks on Buzz Me were penned by Noah or his Stratocat mates, Josh Johnson (drums) and Marty Romie (Bass). 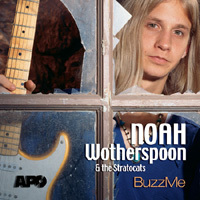 With the propulsion from thier first release, Noah & The Stratocats are likely to buzz your area sometime soon. Don't miss the next guard on its way up!